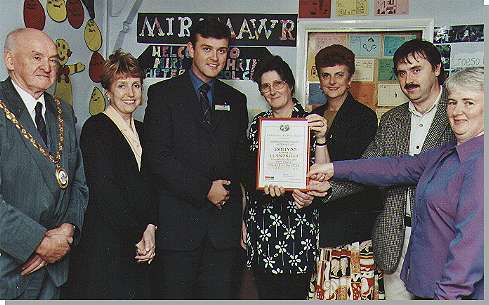 Llandrillo is the best village in Denbighshire 2000 - and that's official! The village, which has just over 450 inhabitants, has been declared the winner of the 'Denbighshire Village of the Year Competition' and received a £400 cheque to go with the prestigious title and certificate. The competition, now in its third year, was organised by Denbighshire Voluntary Services Council. Two representatives from outside the county judged the village and the numerous other entrants. Having evaluated what every village offered, Llandrillo overall came top of the five individual categories of village life. The £400 prize is to be put towards playground equipment, but the competition for Llandrillo doesn't end there.